It’s hard to believe that a perfectly preserved medieval village is only a 30 minute bus ride from Monaco or Nice. Yet here it is: tiny, ancient, picturesque Eze sits on a cliff overlooking the glamorous St Jean-Cap Ferrat. The Mediterranean is framed by the terracotta rooftops of Eze, inspiring many landscape pictures throughout the ages. The village has been consecutively occupied by Romans, Moors and Italians. In recent years Eze has attracted many artists, writers and philosophers such as Frederic Nietzsche, Stéphen Liégeard, Walt Disney, Lenny Kravitz and Angelina Jolie. 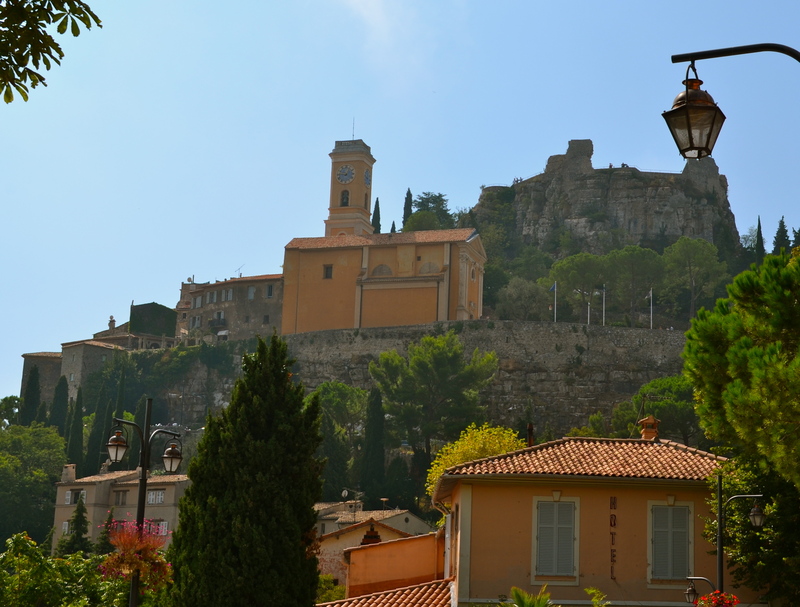 Eze is particularly beautiful in the late summer, the weather is warm and dry, the days are long and there are slightly fewer day trippers from Nice and Monaco. Although popular for a one day outing, there are opulent hotels in the old town on which to splurge such as the Chateau Eza – a converted chateau on the Rue de la Pise with a panoramic view of the sea. Prices start at around €350 per night. Rooms are palatial, the service is outstanding. Four hours is all that’s needed to see the tiny town and get a good workout – there are a lot of hills to navigate but nothing too difficult. It’s wise to head for the top of the village before the summer sun starts baking roads. Eze is small and easy to navigate. The Church of Our Lady Of Assumption is a distinguished, 18th century treasure at the pinnacle of the town and is visible from a distance. It’s a 10-15 minute walk from the main road, where the buses arrive. Once you have inspected the church in its baroque magnificence, follow the path and head down the hill. You’ll come across is a spice stall on the way down, although apparently they do move around, but ask and you will find it, usually around the church. It’s easy to see why artists have be so inspired by Eze throughout the years with its vivid and fragrant spices which have been sold here for centuries. 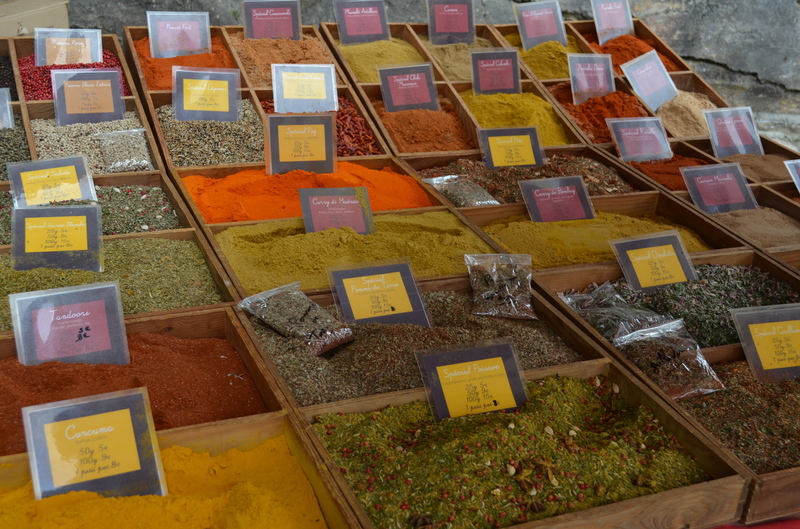 The selection of spices is impressive with original spice mixes that make a unique souvenir in their small glass jars. 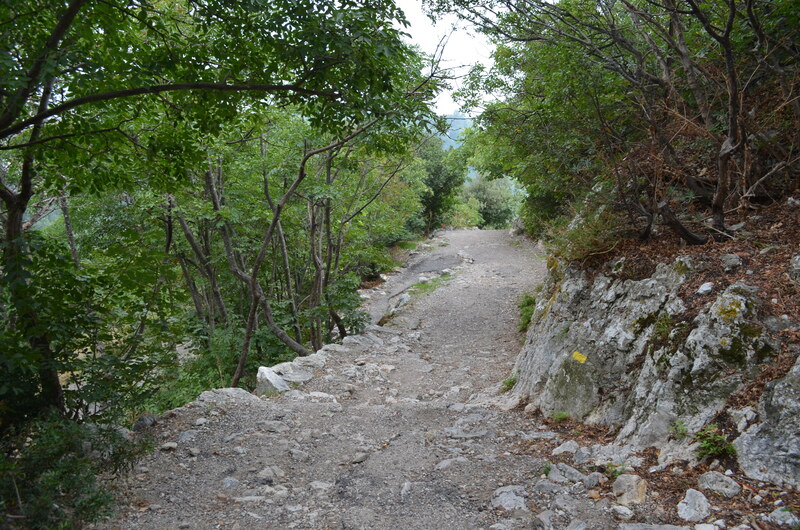 Half way down the hill you will see Le Chemin de Nietzsche, or Nietzsche’s Path. If you are feeling energetic, take the 2 hour trail down to the sea. The walk back up the hill is, of course, considerably more taxing. Eze has retained its medieval charm, at the centre of the village there are cafes and bars; shops selling soap and olive oil – not a neon sign or multi-national chain store in sight. While Eze certainly caters for the rich and famous, there is plenty for the regular traveller to enjoy . The luxury Chateau De La Chevre D’Or offers five star accommodation as well as a fine dining experience. Michelin rated restaurant La Chevre D’Or serves lamb, seafood and other local delights. Lunch sets are €95 per person. As I was alone, I thought that a meal at Chevre D’Or, however highly recommended, would be wasted on me – scruffy, in my shorts and t-shirt toting pots of spice and lavender – there is a dress code and booking is advised for lunches, necessary for large groups. Another option is a local place such as Colette Cafe Restaurant and Wine Bar in the Place de la Colette, which is also chic but not formal. 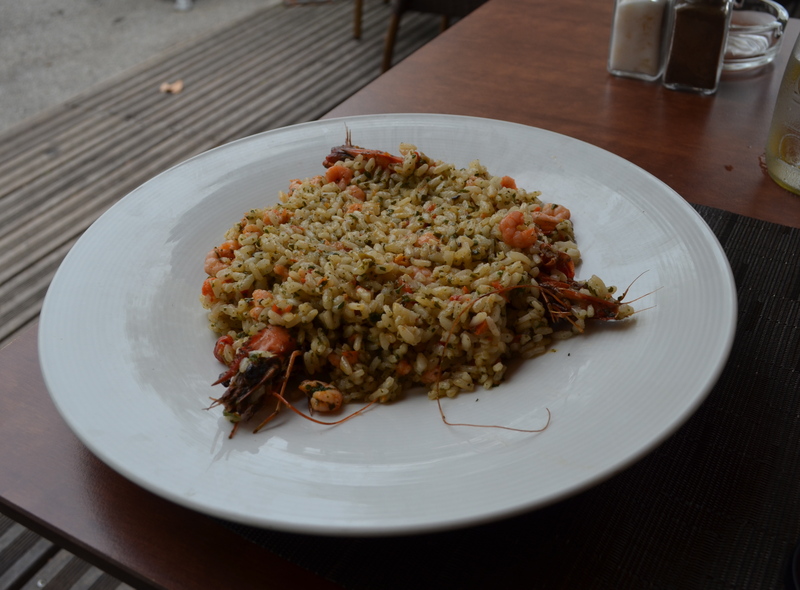 I went for a langoustine risotto, le pain rustic and a mineral water. For €20, which is the average price in Eze at a local restaurant, it was outstanding. 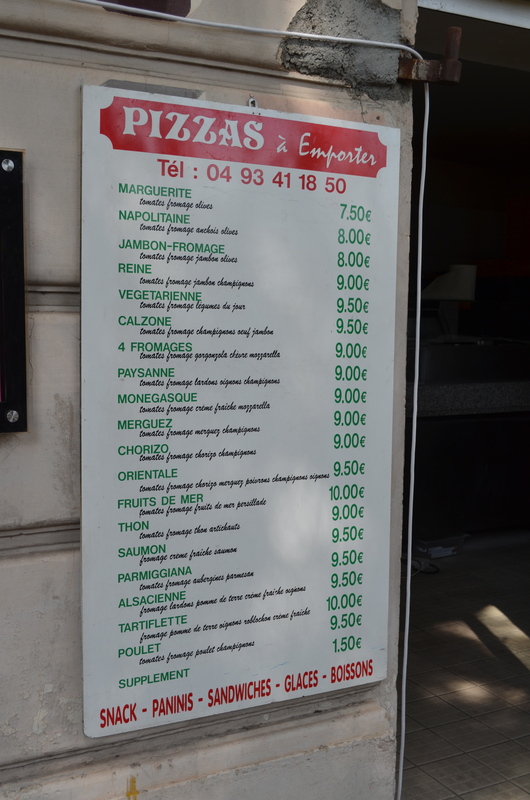 For those seeking simple fare, there is a no frills lunch option: pizza and sandwiches on the main road for around €8. Another sought after venue on the Eze trail is the Fragonard l’Usine Laboratoire – worthwhile visiting for anyone as the tour is free. After the factory tour you are given the chance to buy some of their high quality products – perfumes, reed diffusers for the home, soaps, candles. The “factory price” seems to be the same as the price for Fragonard products in all the shops in Nice, so there is no need to stockpile – you can find them all over the Cote d’Azur. More substantial gifts and souvenirs can be found in Eze’s small art galleries which offer local and international art. Yes, Eze is all about tourists. Despite the complaints of seasoned travellers in search of a local experience, tiny places such as Eze survive because of the tourist trade, which is what preserves the small villages on this area. Embrace it and enjoy the fact that these places still exist. Eze is easily accessible: Bus 112 from Monte Carlo will take you to Eze Village in about 30 minutes and the 82 bus runs from Nice to Eze. The buses run regularly and cost €1 per person. Be sure to check the time of your last bus before you head up the hill, taxis are hard to come by and are an expensive option. Is it that much ancient….unbelievable..! I’ve been there too, such a beautiful little place. A great break from the busyness of Monaco.